Sometimes things go well . . . and sometimes they don’t! 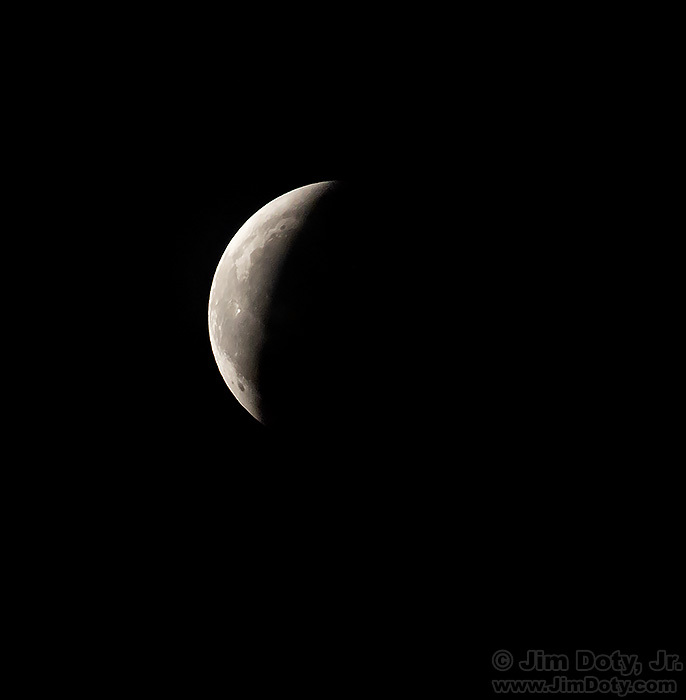 I had high hopes for the January 20-21 lunar eclipse. Unfortunately, January 20 was a cloudy day. A cloudy, overcast sky is not good for seeing, much less photographing a lunar eclipse. For some evening and night photography, a few clouds lit by the moon can be quite beautiful. But this was different. As the sun set there was barely any blue sky. As the moon rose I could see it through the clouds, but it was just a round, while ball with no features. 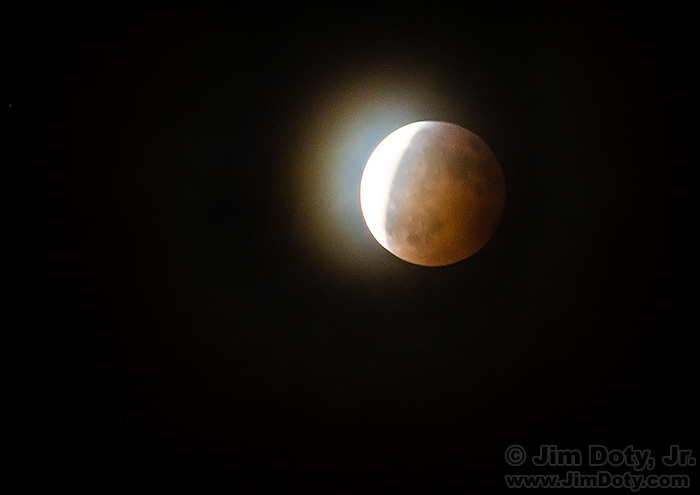 Later in the evening as the eclipse began the clouds were thinning a bit, so I was still hoping. Lunar Eclipse. January 20, 2019. I took my camera and tripod outside and set up. The band of clouds across the moon was still there. The clouds were impossibly bright compared to the shaded surface of the moon, The glare from the backlit clouds sapped much of the color out of the pictures and softened the well defined features of the lunar surface. This is my best photo of the moon that is exposed for the part of the moon in Earth’s shadow, and it is pretty disappointing. Sometimes there just isn’t much you can do about the situation. The photo at the top of this article was exposed for the sunlit part of the moon. The sunlit surface of the moon is so much brighter than the backlit clouds that they just disappear. 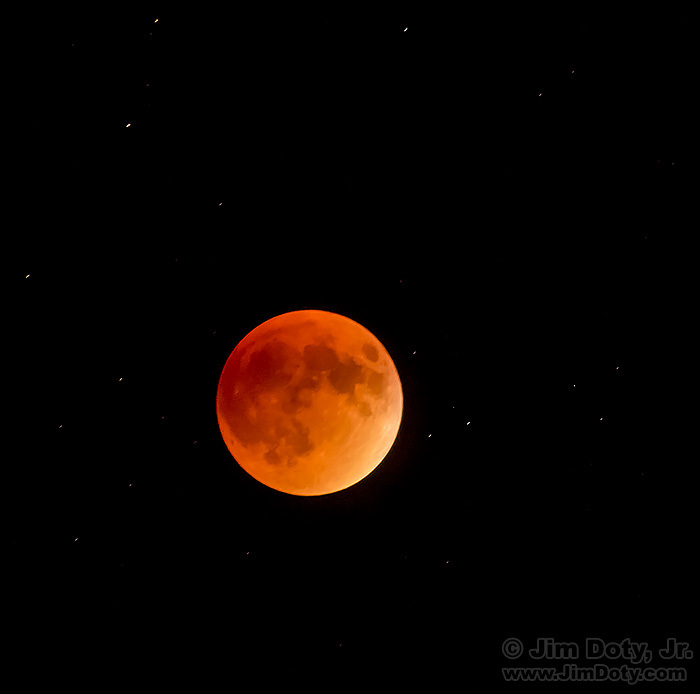 Lunar Eclipse, Super Blood Moon, Rocky Mountain National Park, Colorado. September 27, 2015. In contrast, I made this image of a total eclipse with a crystal clear sky in Colorado. Such a difference! Part of the fun of photography is the unpredictability of it all. For four days you don’t see a single bighorn sheep at prime location. On the fifth day the meadow is full of sheep. You don’t see a single bull elk for three days in Rocky Mountain National Park. And then one walks right by your car. One day there are thousands of wading birds at one of your favorite wildlife refuges. The next they are almost all gone. It is the days that don’t work that make us treasure the days when everything comes together. Although I didn’t get the eclipse photos I wanted, photographer friends of mine in Ohio and Michigan had clear skies and ended up with great photos. Ansel Adams was a full time professional photographer who rarely took a day off. He said “Twelve significant photographs in any one year is a good crop.” That is a healthy way to look at things. You aren’t going to hit a home run every day. So the next time you head out with high hopes and things just don’t come together, just remember that is true for everyone who photographs the great outdoors. If you keep at it, there will be more days, and some of them will be amazing.